Your logo is one of your most important marketing assets (and having an animated logo design can make it stand out even more). It makes you easily recognisable and it’s the first thing people see when they come into contact with your brand. It’s also one of your most used assets in marketing, whether it’s on your website, your social media profiles, company memos and official stationery, product packaging, or anything else related to your company. If you don’t already have a logo, then take a look at our logo design service. In these days of social media, you probably know that videos should be a part of your marketing strategy. But did you know that you can spice up your promotional videos by using an animated version of your logo? The primary purpose of a logo is to create company brand awareness. 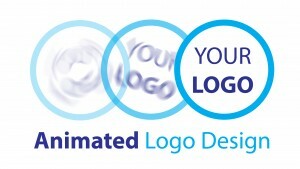 When you design an animated logo, you’re creating a more memorable image in your customer’s mind. In most cases, logos are static images and it may take several interactions with your brand for the customer to make a permanent connection. But with the clever use of animation, your entire brand comes to life through motion, sound, and color. More often than not, an animated logo will immediately create an impression in your customer’s mind, thus increasing the brand awareness. During your video: You can also use a smaller version of your animated logo during the video in one of the bottom corners. On your website, in place of a regular logo: Most companies use their static logo in the header area of your website. Why not put a unique spin on this by using the animated version of your logo. Set the animation to play once and you’ll be sure to stand out among the competition. On your Facebook page: Post a video file or a link to your animated logo when you’re sharing promotional content from your website. Did you know that you can animate the profile or cover photo of your facebook page, again standing out from the competition. Contact us today to create a custom animated version of your logo.